Though sound moderators, or suppressors, have only become popular in recent years, they have been around for well over a century; American inventor Hiram Maxim was marketing them as long ago as 1902. There are a number of reasons for an original lack of interest; early models were heavy and cumbersome, and some countries have restricted or banned completely their use by private individuals. If you plan to take a moderated rifle on an overseas hunt it’s worth checking local regulations first. Moderators are occasionally referred to as silencers, but this is a misnomer as it’s impossible to silence the report of a high-velocity bullet completely. When the rifle is fired, two sounds are heard if you are close to the passage of the bullet. The first is the supersonic crack of the bullet passing, followed by the thump of the rifle discharging that follows shortly afterwards. It is the latter that gives away the direction of the firer, and the time between the two sounds also gives the observer an indication of how far away the firer is. Most animals can correlate these noises to determine the danger source. The science involved is fairly simple. The gases produced by the fired cartridge are vented through a series of baffles that cool and condense them, lowering the overall pressure, before releasing them into the atmosphere; this reduces the noise of the final venting and thus the sound of the rifle being fired (the thump). It does not, of course, reduce the crack of the bullet, nor does it have any significant effect on velocity. Though sporting rifle moderators are classified in law as firearms in their own right, it has never been easier to get one added to your firearms certificate. It wasn’t so long ago that you had to provide serious justification, but now the situation is different. Health and safety concerns, together with an increasing awareness of noise pollution, have played a large part, against specific worries about hearing loss. Interestingly, the moderator takes on the legal characteristic of the firearm to which it is fitted. Ownership is unrestricted if it’s for use with any airgun that does not require an FAC, and a shotgun moderator becomes a Section two item if the shotgun itself is Section two. For a sporting rifle it is considered Section one, and you’ll need authority on your FAC before you can acquire one. In terms of noise, fitting a moderator to a rifle can bring a significant reduction. An unmoderated rifle might produce well over 160 decibels (dB) of sound, but a moderator could reduce this by as much as 35dB. To put this into context, employers are governed by the 2005 Control of Noise at Work regulations that consider 140dB to be a peak exposure limit value. Hearing damage is irreversible, and how many of us pause to put on hearing protection before taking a shot when we are not on the rifle range? This is one of the most compelling arguments for moderating your rifle. Noise suppression apart, there are a number of other benefits that come from fitting a moderator to your rifle. Recoil reduces by about a third (some manufacturers claim even more than this) and as a consequence, most firers find that their shooting accuracy improves considerably. Muzzle flip also reduces, which means that the firer can observe the strike of the bullet or the reaction of the target. All of these advantages mean that sound moderation is good for the environment, the shooter, and indeed the quarry. Disturbance to the environment, caused by the rolling booms of unmoderated rifle shots, is minimised, and everything in the neighbourhood is not put on alert by the first shot. The result is often an increase in chances for the stalker. Furthermore, you are not waking up householders or causing unnecessary alarm. Noise nuisance is an ever-present consideration, and the thinking stalker should always ponder how it can be reduced. Disturbance to the environment is an interesting area, especially when you consider the effects of the moderated shot. Thinking back to the crack and thump effect of the rifle, deer certainly seem to have little idea of where the firer is located once the thump is removed. Often, when one of a group falls, the remainder may actually move towards the firer — especially useful where there is a cull to complete. Some park herd managers do not like to use moderators for this reason, preferring the deer to know where the danger is coming from and when it has ceased so that they settle more quickly once the cull has finished. One manager of a large deer park in europe shoots unmoderated for a different reason — he wants the general public to know that shooting is going on, and thus keep away! As far as the quarry is concerned, increased accuracy means more humane culling. Even if the shot is misplaced, the firer has a better chance of seeing what has gone wrong and planning his follow-up. There are a few disadvantages associated with moderating a rifle. Not least is the weight penalty of adding anything up to 800g to the muzzle end, with a corresponding change in balance, but most users report that they quickly get used to it. You are also adding length to the rifle, though many moderator designs sleeve back over the barrel and minimise this effect. Choosing the moderator that’s right for you is a compromise between bulk, weight and efficiency. Generally, the larger models are quieter, but modern materials have done a great deal to reduce weight. Owners of cherished rifles may be reluctant to alter them, as there is no denying that a moderator changes the aesthetics considerably. If your rifle has a foresight, this may well have to be removed to permit screw-cutting or the fitting of some sleeve-back designs. Screw-cutting needs to be performed by a competent gunsmith to ensure that the thread of the moderator is properly matched and that all tolerances are correct — it is certainly not a job to be undertaken on a lathe at home. If you’ve not already tried a moderator, maybe now is the time. You’ll notice the differences immediately and wonder why you didn’t get one years ago. 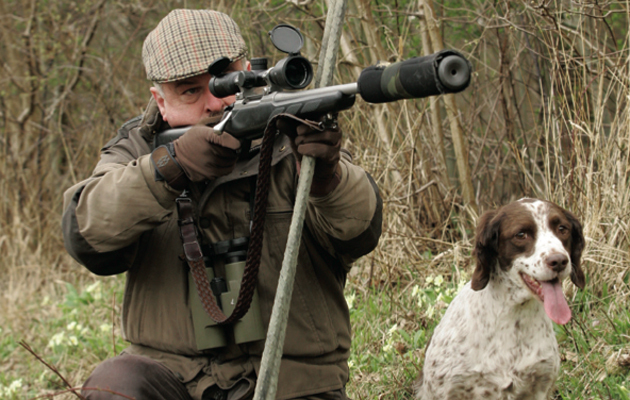 Your shooting will improve dramatically, you’ll disturb the environment less, and you’ll likely shoot more deer or vermin. Above all, your hearing, that most precious of commodities, will be protected. Hearing loss is irreversible — take it from someone who has suffered from tinnitus since his early days in the army. There’s no excuse for the modern generation of stalkers and vermin controllers to suffer it now that such an integral form of protection is so readily available.